Get a head start evaluating Windows 10--with technical insights from award-winning journalist and Windows expert Ed Bott. This guide introduces new features and capabilities, providing a practical, high-level overview for IT professionals ready to begin deployment planning now. This edition was written after the release of Windows 10 version 1511 in November 2015 and includes all of its enterprise-focused features. 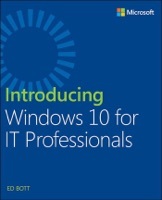 The goal of this book is to help you sort out what’s new in Windows 10, with a special emphasis on features that are different from the Windows versions you and your organization are using today, starting with an overview of the operating system, describing the many changes to the user experience, and diving deep into deployment and management tools where it’s necessary.